Julie Baumgart is one of three school counselors at Western Boone Jr./Sr. High School, and says counselors are pulled in many different directions. Can you explain the job of a school counselor? If you ask that question regarding anyone else in a school- a teacher, the principal, nurse or custodian- the answer is pretty straightforward: Teach students, manage the school, attend health needs and maintain cleanliness. But a counselor’s job can vary from school to school, and many have duties ranging from creating student schedules, proctoring ISTEP exams, lunch duty and even managing the school’s mascot costume. All of this is something Vice President for Education at the Indiana Chamber of Commerce Derek Redelman says his organization has known anecdotally for a long time. “So we just wanted to educate ourselves and see what the lay of the land was and then try to figure out if there are some things we as a representative of the employer community could do to help those issues,” Redelman said. So the Chamber surveyed more than 400 school counselors in the state, and found a lot of their job has nothing to do with counseling. The report was a follow up to a similar one released 20 years ago, and unfortunately the major issues facing guidance counselors remain the same: high student to counselor ratios, growing list of non-counselor tasks, lack of counselors and increased emotional needs of students. 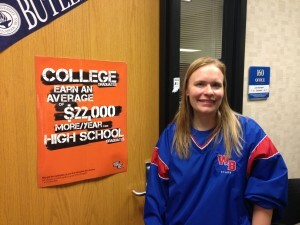 Julie Baumgart is one of three guidance counselors at Western Boone Jr./Sr. High School, and knows too well the challenges facing others in her profession. And being in “no man’s land” means many counselors are proctoring ISTEP exams, monitoring the lunchroom, and not spending enough time consulting students and parents about a student’s academic and emotional needs. Almost half of the 400 counselors the Indiana Chamber of Commerce surveyed said they spend only 10-25 percent of their time doing college and career prep. One barrier to helping students is student to counselor ratios; Indiana has some of the highest in the country, averaging 600 students per one counselor. And in this respect, Baumgart considers herself lucky. Of the 850 seventh through twelfth graders at Western Boone, Baumgart is responsible for around 275. In a time of budget cuts and school consolidations, counselors are often the first position to be cut. 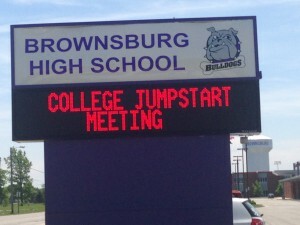 But in the last few years at Brownsburg High School, Superintendent Jim Snapp decided to make counseling one the most important aspect of his students’ school experience by creating grade level teams make up of an assistant principal, guidance counselor, academic coach and administrative assistant. Brownsburg High School created a new counseling program a few years ago that allows counselors to focus on students. This team starts learning about students on their team when they’re still in eighth grade and work with them until they graduate. Snapp says each team member has a specific duty, but they all work together to make sure the academic, emotional and behavioral expectations of a student are clear and met. And knowing the kids well is paying off. “In 2009, when they started to calculate graduation rates a little differently we were at an 89.9 percent graduation rate,” says principal Bret Daghe. The next year, the team model was introduced, and the graduation rate was dramatically different, rising to 97.5 percent. The team approach helps counselors as well, says Angie Creed, Director of Guidance at Brownsburg High School. Snapp says shifting to a team approach while the district faces budget issues comes at a cost. But not every counselor in Indiana has a team to support them, and Baumgart says despite being pulled in many different directions, she hopes she is still making a difference to her students.